I am back from my work trip and I am so happy to be back home! Last week, hubby brought back strawberries from work and as there were too many to eat I decided to make some jam with the left overs. It was my first time making jam and I found it so easy I’m wondering why I didn’t give it a go earlier. Here is the recipe I used. I just put all my ingredients in a pot over the heat and brought everything to a boil, then I put it on low heat for around 40-45 min, making sure to stir from time to time (every 10 min or so) and that’s it! I think the consistency is really good, if you like your jam a bit firm, I would suggest either cooking it for longer or adding some agar to it. I thought that overall it was super simple and I wish I had given jam a try before today. Are there any recipes you’ve tried that ended up super simple and that you wish you had given a go earlier? With Christmas inching closer by the minute, I’m making sure that all the presents I already have are nicely wrapped and tucked under the tree. 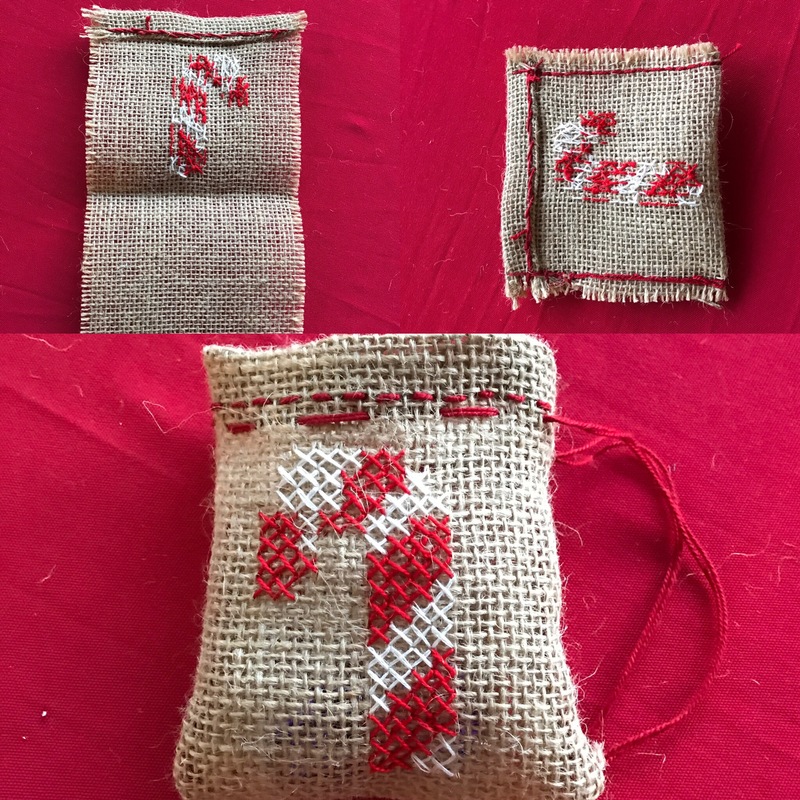 I’ve been making a few small items to gift this year and I’ve seen some really cute drawstring burlap bags in stores that looked perfect to wrap those gifts. The already made bags were pretty expensive though compared to just buying the burlap so I decided to make my own using stuff I already had at home. You will need some burlap, coloured thread of your choice, a needle and as an option you can also use embroidery thread to stitch some festive design at the front of your bag. 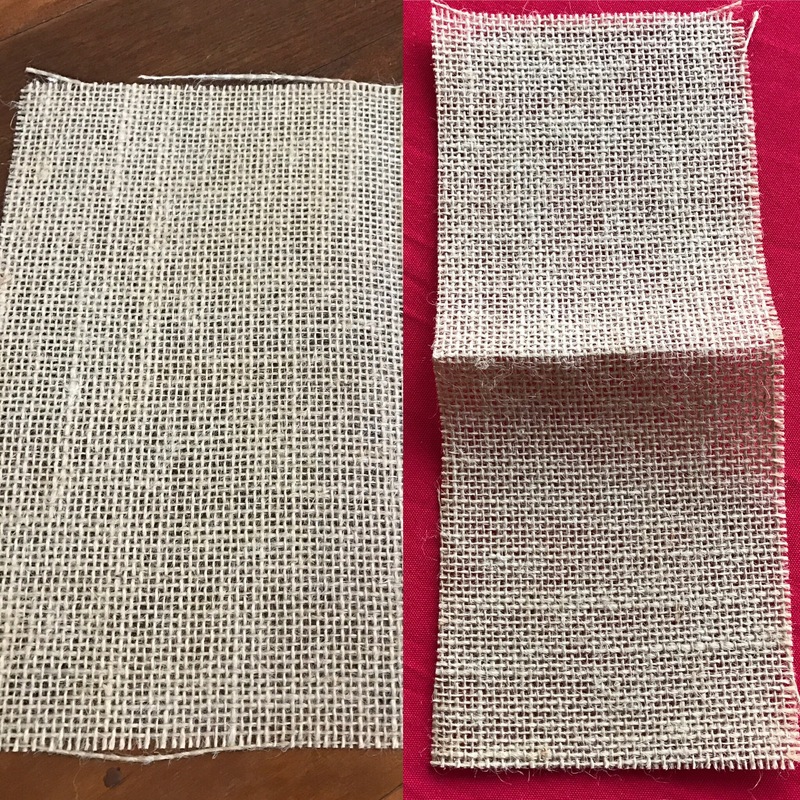 I used already cut burlap sheets, which I cut in half to get a long strip. 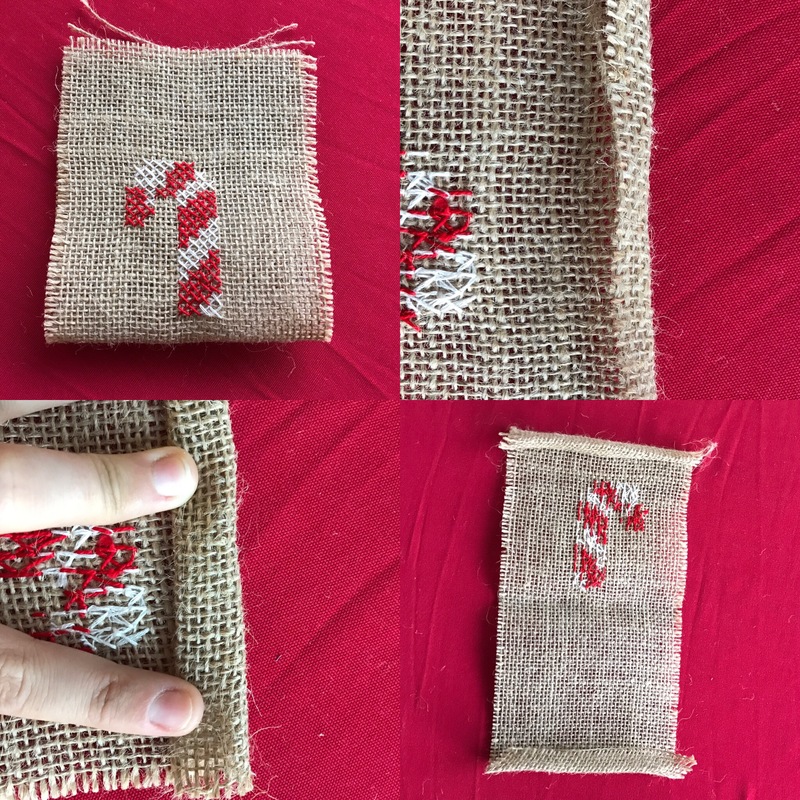 I stitched a candy cane on the front of my furure bag (but really you can stitch anything), making sure to leave enough space at the top to fold over twice in order to hide the raw edge. I did the same on the other short side of the rectangle. I then top stitched each of the folded short edges. Making sure I had the wrong side of the stitching facing, I sewed the sides of the bag. Finally, I turned the bag with the right side out and I threaded a cotton cord just underneath the top stitching. Lately I have been obsessed with MasterChef! The new season started a few weeks ago and it has really given me the drive to cook and bake more. Today I want to share with you my family’s Montecaos recipe. These little biscuits are originally from North Africa, and my family adopted them and brought them back when they emigrated from Algeria. The good think with those is that they are completely Vegan, and I have found that more and more people don’t eat animal products so it’s a good recipe to bring if you are baking for lots of people and you don’t know if they eat animal products. I have also tried them with a gluten free flour (a mix of rice flour, corn starch and tapioca starch) and they work really well either way! Preheat the oven on 180°C. The cooking has to be perfect so make sure your oven is at the right temperature before baking any of your biscuits. Mix the flour and sugar roughly together before adding the peanut oil. Knead the mixture until you obtain a dough with the consistency of wet sand. It shouldn’t be so wet that it is sticky but it should also stay together quite well. Roll into small balls of dough and rest on a baking sheet. When the oven is at 180°C, bake for 5 minutes at 180°. Then, turn the oven down to 150°C and bake for an extra 5 minutes. I normally turn off the oven at this point and let the biscuits in until some of them show cracks at their surface (note that this only happens with the ones made with normal flour, the ones made with gluten free flour don’t normally crack). Let them cool a little and sprinkle with cinnamon or chocolate powder. And you have them! Delicious crunchy sandy biscuits 🙂 I made two different batches this time, some with and some without gluten. Can you spot the difference? This week just went so fast, probably because it was only a 4 days week 🙂 and with the end of the week, we start a new month! As promised, I will be starting a Lord of the Rings CAL this month and I’m super excited about it. However, before we start, I thought I should put together a photo tutorial for the stitch I’ll use for this CAL: the bobble stitch. If you’ve been doing a lot of graphghans, chances are that you’ve already seen this stitch, or at least heard of it. This is what a finished square looks like (picture found on Repeat Crafter Me, Sarah actually also has a very good tutorial for the bobble stitch, with some great videos for colour change). As you can see, each bobble is meant to be a square from the graph. The first time I tried this stitch, I got a bit confused because the whole graph is worked from the back, which means that when you do a bobble, the textured part will be facing out, not towards you. Then in order to have all your bobbles facing the same way, you need to do a row of sc (U.S. dc) in between each row of bobbles. 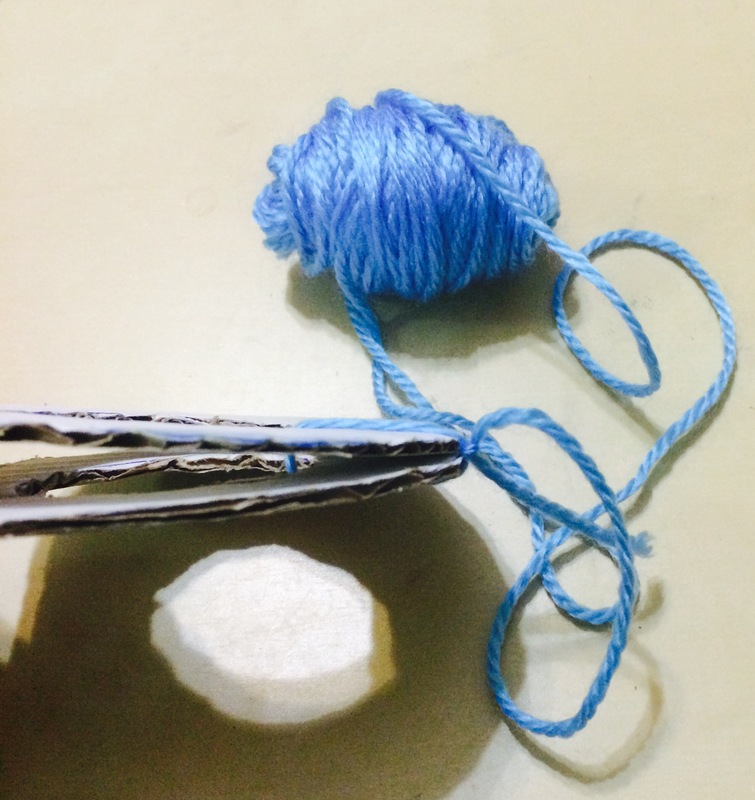 The first thing to do when starting a bobble stitch graphghan is to make a chain. To know how many ch to do, multiply the number of squares from your graph by 2. For example, my graph is 60×60 squares, I want to chain 120. Chain 1 (this is your turning chain) and sc in each chain, starting from the second chain from your hook. If we continue from the example above, you will now have 120 sc. Now comes the tricky part: the bobbles. You want to chain 3 (turning chain) and dc 4 stitches together (U.S. tr 4 together) in your first sc. Then sc in the following sc. This will make your bobble ‘pop’. For each bobble, you then need to dc 5 together (the chain when you turned counted at your 5th dc). Click on each picture for the caption. There are 4 yellow sc, which correspond to 2 bobbles. Only pull the yarn through the first loop. Then, sc in the next sc. The only thing left to do is to follow your graph and change colours when needed. When you change colour, I would recommend changing at the end of the sc after the bobble. instead of pulling yellow yarn through, pull your black yarn instead. You’ve changed colour! The next row, simply sc all the way back, and don’t forget your colour changes! You are back to 120 sc and you are ready for the next row of bobbles! I hope that this photo tutorial was helpful, if you have any question, don’t hesitate to leave me a message, and if you want a video I highly recommend Sarah’s video on Repeat Crafter Me, that’s how I learnt! The first graph for the centre square (which will be the biggest square as well) will be posted on Sunday (3/04) so keep an eye out! 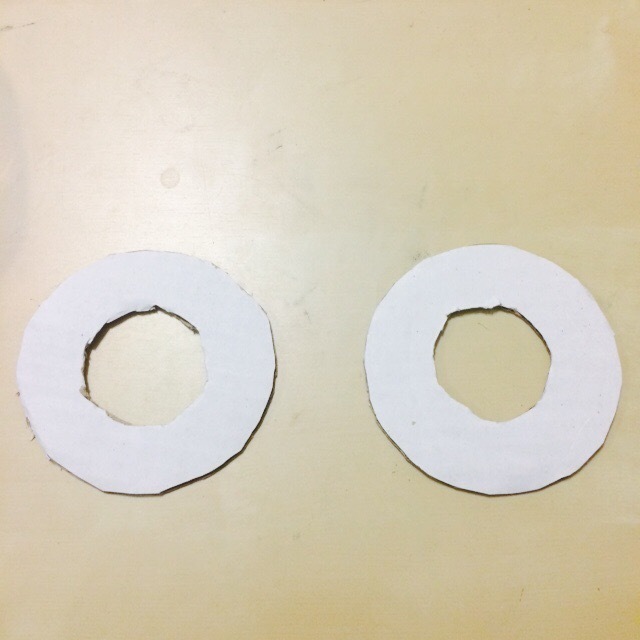 So here it is, you need to cut 2 rings that are the same size in cardboard. 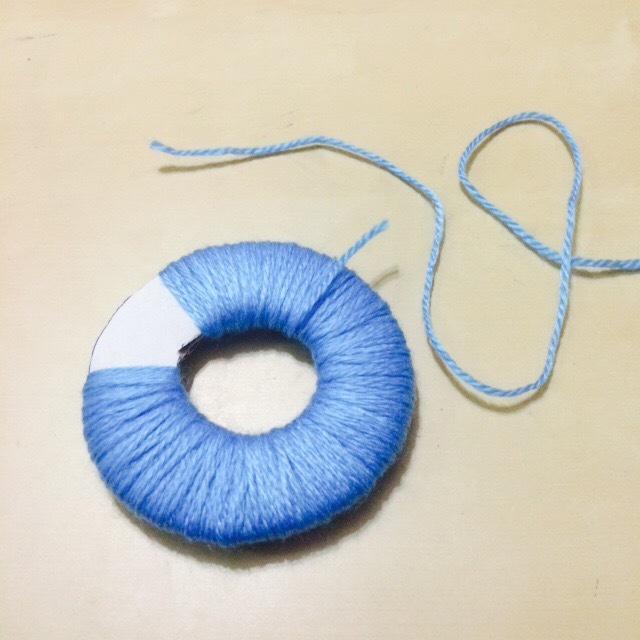 Then you put both rings together and tie the yarn on the rings. 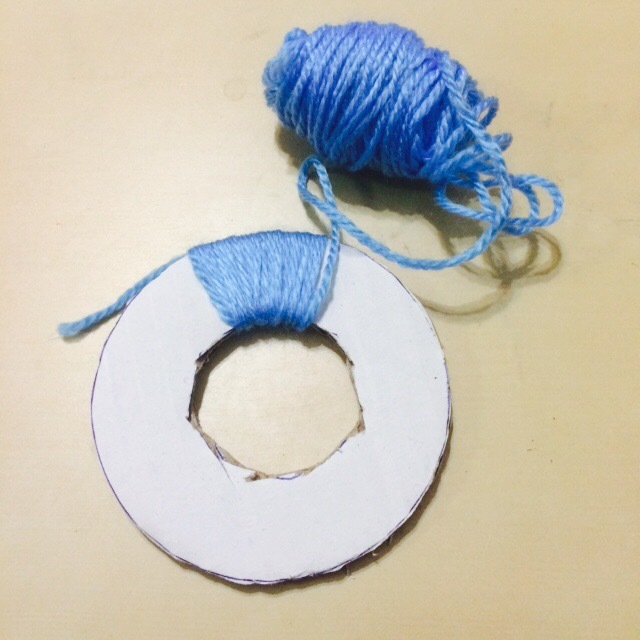 Make sure that your yarn ball is small enough to fit through the centre of your ring. 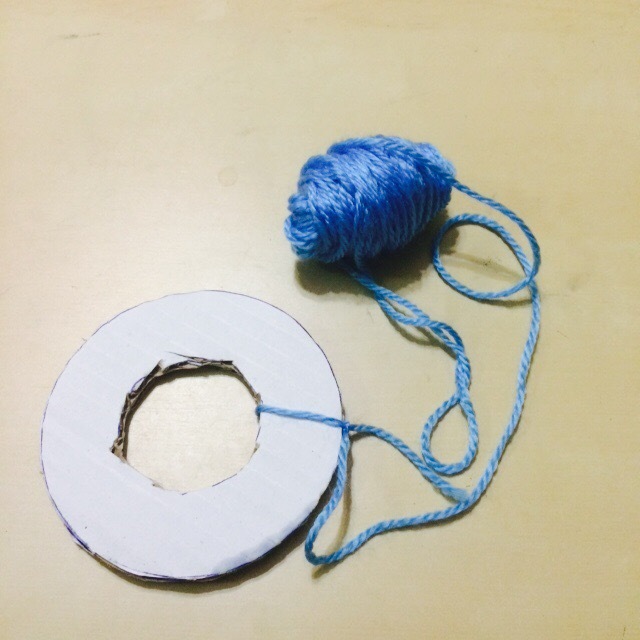 Your next step is to wrap your yarn around your ring. 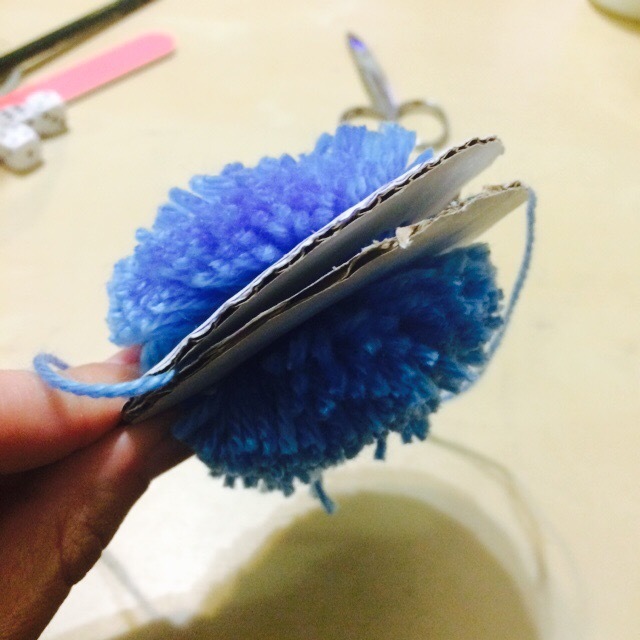 The thicker you wrap it the bigger your pompon will be. 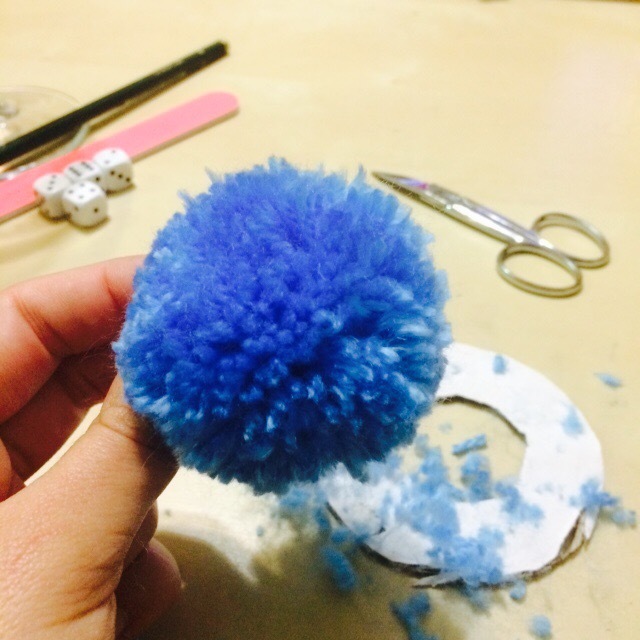 This is the hardest step, you need to cut the pompon. 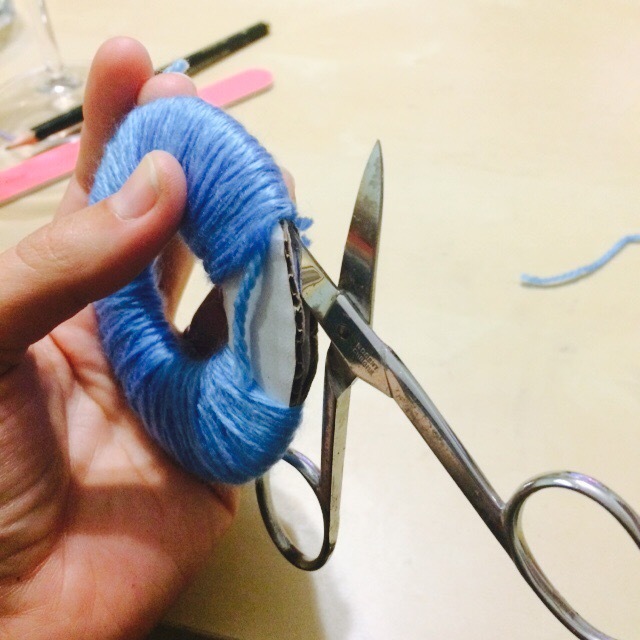 Put your scissors in between the two rings and make sure you hold on to your yarn while you cut. 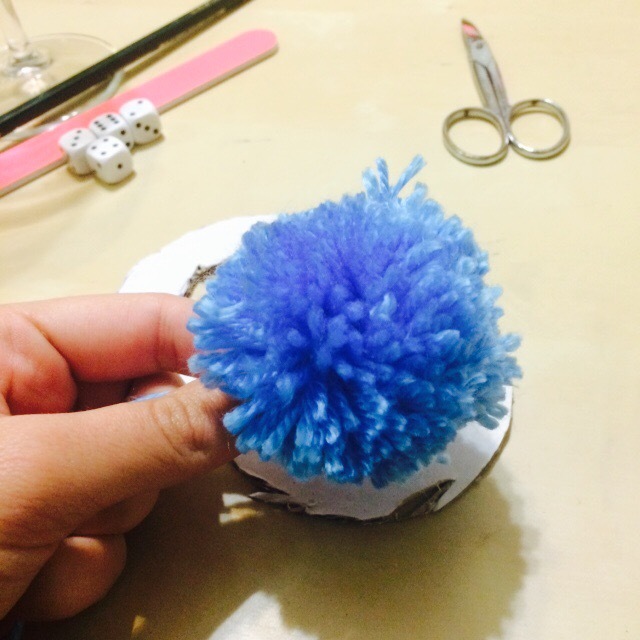 Then use a thread of yarn in between the rings to tie your pompon together. 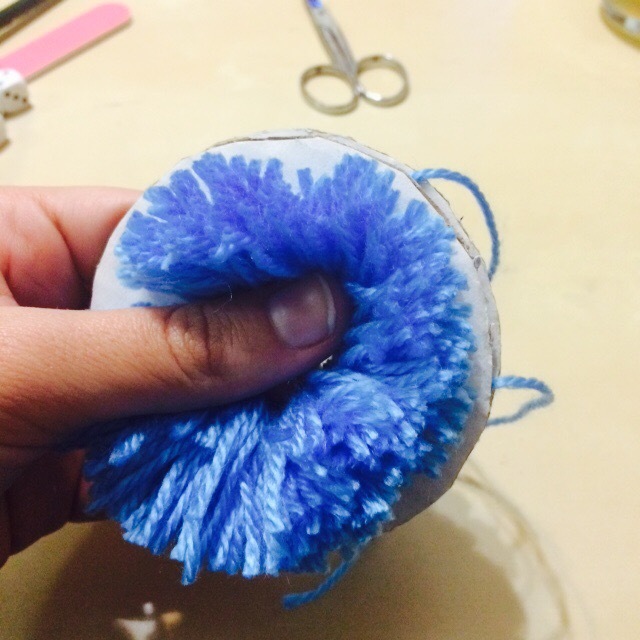 Your last step is to tidy up and make your pompon more even by cutting off the threads that stick out. Here it goes! 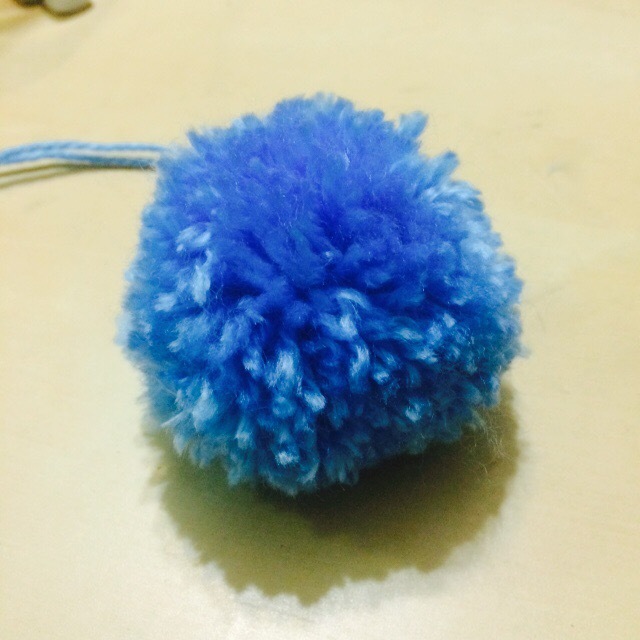 Your pompon is finished! Hope this was clear, don’t hesitate to ask me if a step is unclear. You can use pretty much any type of cardboard.